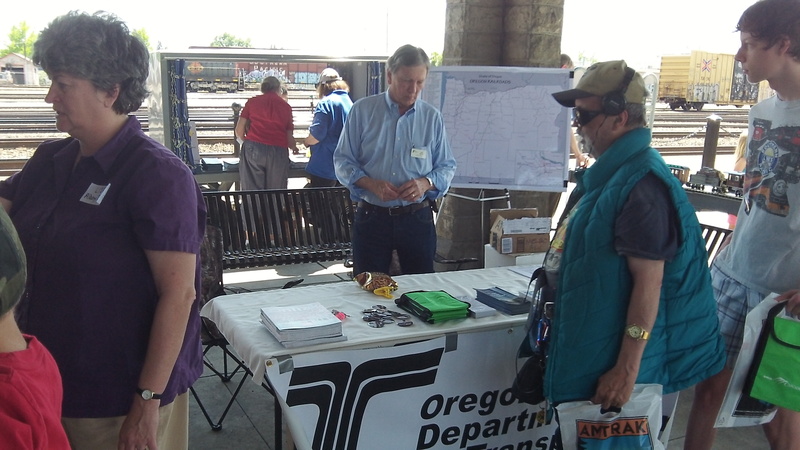 ODOT’s Bob Melbo mans a table at a special train event at Albany Station last May. What do you know! After nearly three years of study, the Oregon Passenger Rail project has concluded that the best route between Eugene and Portland is the existing rail line between Eugene and Portland. But is this final? Hah, you dreamer! No, it’s preliminary. More study to follow. This study, funded by about $10 million in state and federal funds, was launched in late 2012 to see about improvements in passenger rail service up and down the Willamette Valley. Several potential new routes were considered and eventually rejected, including one through Corvallis and other points on the west side of the valley. Then the study’s leadership council of elected officials, including Albany Mayor Sharon Konopa, picked two alternatives for more detailed analysis. One would have routed train service along a new track along Interstate 5 from Springfield to Oregon City. The other was to use the main line of the Union Pacific, the one that Amtrak trains now use, and to make improvements there. This is the route that railroad engineers picked in the 19th century, and now it’s the preferred know alternative in the current study. Unfortunately, as the study team says in a recent news announcement, “the recommendation is not a final decision — all alternatives will be analyzed in the DEIS (draft environmental impact statement) before a Final Preferred Alternative is identified.” The draft statement is not due until late in 2016. But that still is not the final step. Public hearings will be held on the draft. And only then will this painfully prolonged process finally conclude. Then what? Then Oregon can apply for federal funds to make the improvements needed so more trains can run and cover the distance in less less time. But it’s possible passenger rail will have died by then, at least in the state-sponsored Cascade service, because the legislature is unlikely to fund it again unless ridership shows a sharp rise. To improve the passenger count, ODOT-Rail has just rescheduled the morning train from Eugene north so people can catch it later and take it all the way to Seattle. I’ve ridden from ALY to PDX multiple times. The low ridership is all about scheduling and the cost/availability of last mile transportation. Hopefully options like Uber and Lyft can help. Getting to PDX, the airport, is clumsy at best using the MAX and navigating through the feral humanoids inhabitants. It’s an option that I like to use, if the schedule is convenient. Take the train to Union Station in Portland. Take the bus to the Max about ten blocks south. Or save time and walk 3 blocks to the Max line near the Willamette River. Max goes straight to PDX. As a student at OSU I can say without hesitation that one way they could get my ride would be to choose that rejected route through Corvallis. As it is, the train is more expensive, slower, and less convenient than taking Greyhound. I’d be willing (and I’m sure many of my friends would be) to shell out the extra dough for a train ride if it came here. The trestle burned to the ground just west of Rex Hill and probably won’t be rebuilt. Set on fire by children. The older route through Forrest Grove was torn up south of Gaston. It would go to to Corvallis from Albany. It would have to back up to Corvallis. Then return to Albany to use the UP Mainline. That would take 2 hours. Recently my wife and I have the opportunity to use the rail service between Great Lakes, Ill. and Chicago. After that ride we came to the conclusion that, until the Willamette Valley is built up to match the population of that part of Illinois, it will continue to be very costly. They have one rail running in each direction and it is used only by commuter trains!!! We rode the round trip on a Friday afternoon and found that the inbound was about 3/4 full, on the return it was hard to find a seat. :Looks to me as though we are spending a lot of money on something that, even though would be nice, is not going to happen before money and time is spent. Amtrak is the best method, for those who can not or choose not to drive, to travel to Southern Oregon as well. By best, I mean most convenient and affordable. I travel round trip to Oakland, CA every few weeks for work, and I have for the most part converted to using Amtrak, whereas in the past I would fly out of Portland. Albany is blessed to have an Amtrak station in the city, from which one can travel throughout the West Coast. In the past year, since I have started traveling Amtrak regularly, I have noticed that the Starlight is usually full year round. I have also talked with folks, and realized that many, many people can not fly due to handicaps or medical conditions, or anxiety. Many others, especially with children choose to take the train as it’s better when traveling with children. For the many folks who complain about crying children on planes, this should be remembered— many families opt out of air travel so as not to subject others to the experience. Many travel for economic reasons — the train is cheaper than the plane (especially when one has to factor in the cost of travel to Portland and the $10/day parking fee). I definitely hear non train riders complain about the DOT subsidy of the rails — but the DOT spends much, much less money on rails than it does on roads and airports. All forms of transportation are subsidized. I believe as a society we need to provide transportation means for all citizens — not just those who are capable of driving a car or taking a plane. It’s hard to find current data from the Federal DOT web site but here is data from 2012 on expenditures. giving data through 2009. Amtrak receives 2% of the budget far far less than any other public transportation mode. Surely if those who do not fly nor take ferries can support the 28.8 billion spent on air travel and 8.6 billion spent on ferries without complaining, those who do fly can also support the 1.9 billion spent on Amtrak. If one wants to trim the federal budget — why target the smallest item in the budget which services the most vulnerable (economically or medically) of the population? I believe it’s driven by politics and the ‘welfare’ label attached to train travel or other services not used by the more affluent and healthy. The old Oregon Electric Railroad used to be packed when it was a quick and convenient way to go places. Trains were popular all across the country. But then there was a revolution that occurred. Trains took a beating because of that, and passenger service declined. Mr. Vannice talked above about how a dual commuter-only line really made the trip easy and enjoyable. The current plan though is still mostly an incremental increase in existing efforts, not an attempt to create a revolution along the lines of the interstate highway system. So we have this problem. Highway capacity is running out. Fixing that is going to cost a real bundle, and just maintaining things is using up pretty much all the cash. Air travel is getting more costly and decidedly is not pleasant unless you pony up the cash for first class. Trains are pleasurable, but not convenient and have to compete for space with rail freight, which is doing a booming business because the cost-per-mile is so cheap. Add to that the radical right that screams “NO TAXES” at every proposal pretty much regardless of what it is. If they keep getting their way nothing will get fixed whether it’s highways or trains or air. For the last 30 years this country has quit doing the kinds of infrastructure investments than made us so prosperous. PDX is pretty nice but many airports stink. The air traffic control system is decades out of date. Bridges can’t handle the demands, such as trying to cross the Columbia, or are in need of repairs. And incremental changes in commuter rail are not going to make a big dent. We need that General Eisenhower approach back in this country. One that looks to what can be, instead of dwelling on what once was. An approach that rebuilds what is ailing and provides new avenues so that we’re not just reliant on a single bet. Yes, it will cost money. It will also provide a lot of jobs, and those jobs support families and strengthen businesses. We know that because it worked before, and it WILL work again.